When artifacts from the tomb of an ancient Chinese legend, the Warrior King, go missing from a New Zealand museum, a forgotten world of darkness and an ancient war re-emerges. Isabelle Kweon is enraged by the theft: She had worked alongside a team of Chinese scholars seeking to find the tomb. She found the tomb’s entrance, and everyone was astounded when they stepped inside to find it amazingly well preserved. Meanwhile, Jian Zhao, a young Chinese man who fled the triads in Hong Kong, is living a quiet life in New Zealand, when he suddenly finds himself caught up in events connected to the tomb, together with his neighbour, Chris Mortimer. No one is safe as ancient forces return to haunt the present. One thing I’ve noticed in all the crime fiction I’ve read set in New Zealand, landscape plays a large part in the story. Often, landscape serves to show a character’s psychological state or a sense of place tells the reader more about a character’s background. Landscape is used in both ways in this debut from Gareth E Solomon. 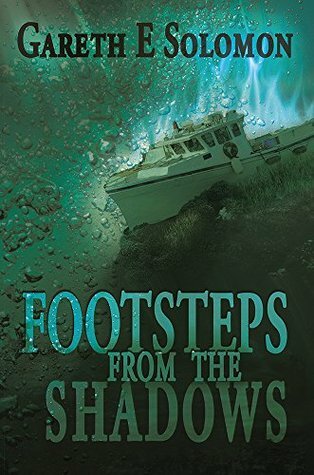 Footsteps from the Shadows is set in New Zealand and landscape features heavily in this tale of stolen art, ancient prophecies and imprisoned demons. As you can tell from this description, there’s a lot going on here. After artefacts from a Chinese archaeological dig are stolen from Te Papa, a storm sees some of the loot sunk beneath the ocean. Triads are after the treasure as is a group of guardians dedicated to keeping demons from being unleashed on the world. As I read I found it hard to keep the strands of the story straight in my head. The reader is warned that scenes shift quickly in this story and there are several characters. The fact that the story shifts so much reminds me of the work of Matthew Reilly, so readers who enjoy his work may enjoy Footsteps from the Shadows. This is an entertaining read that adds to the work being done by New Zealand authors. Solomon also depicts New Zealand landscape in a vivid way. A strength of this story is that it may appeal to an international readership as the plot moves along speedily and doesn’t come across as a New Zealand story per se; the story is global in scope and is set in New Zealand, China, Hong Kong, and also mystical realms. For readers who like a story that moves along and want to be entertained, Footsteps from the Shadows may be suitable. I can imagine reading this on a long flight and being diverted, so give it a go. Shane Donald is a New Zealander living in Taiwan. An avid reader with 3,000 books in his home, he completed a dissertation on Ngaio Marsh for his MA degree, and also has a PhD in applied linguistics.